I love Star Wars. I’m a huge fan of the original trilogy, and I booked tickets to the opening night of The Force Awakens as soon as they became available. With those bona fides out of the way, I can admit that I don’t love The Force Awakens. Having more in common with modern blockbusters than the original Star Wars films, The Force Awakens makes me realise that Star Wars simply isn’t made for people like me any more. What do I mean by “people like me”? I don’t mean “Star Wars fans”, because The Force Awakens was undoubtedly crafted with fans in mind. It panders slavishly to their sense of nostalgia, bringing back many of the original cast members and essentially retelling the story of A New Hope with a race to capture a droid carrying important information, an escape from a desert planet, the revelation of the Force to a young adventurer, an important death, and a battle between rebel fighters and an enormous battle station. 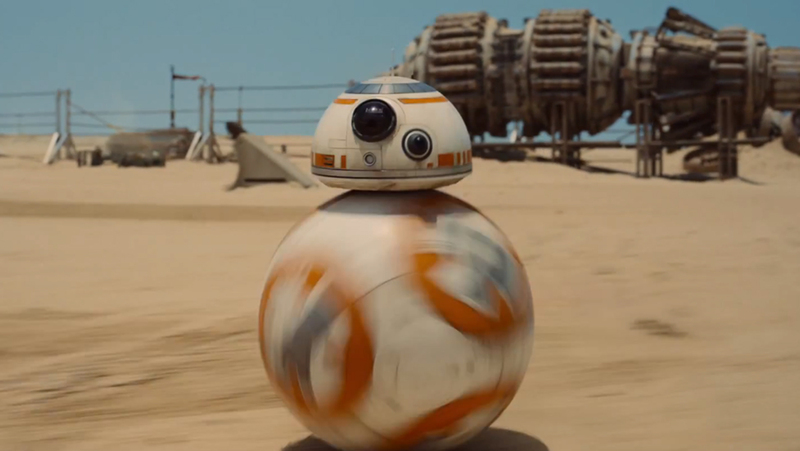 Far more than the three prequel films, The Force Awakens looks and sounds like Star Wars. The return of practical special effects is joyous, and watching grimy X-wings shoot down screaming TIE Fighters is iconic in the way that the implausibly shiny spaceships of the prequels never were. There is a sense of adventure and discovery I haven’t seen in Star Wars since a young Luke Skywalker first held aloft his father’s lightsaber and the blade crackled into being before his eyes. As a Star Wars fan, I thoroughly enjoyed it. Practical special effects don’t get any better than this! So I’m not saying that The Force Awakens wasn’t made for fans of Star Wars content, because it was. But it certainly wasn’t made for fans of Star Wars’ cinematic pedigree and of the type of cinematic craftsmanship found in the original trilogy. Specifically, I’m talking about the way the original trilogy was paced, and the way classic films of that era were paced. Is a slow pace always bad, and a fast pace always good? I don’t think so. “Pacing” is a commonly used term in film criticism. It generally refers to the rate at which a film moves from one idea to the next, which can be expressed in story acts, scene transitions, camera movement, dialogue and more. One criticism I hear a lot these days is that a film is “badly paced”, or alternatively that a film is “too slow” – as though the two criticisms are synonymous. But is a slow pace always bad, and a fast pace always good? I don’t think so. One of the keys to good drama is a varied pace: to have a film alternate between moving fast and moving slowly. Good drama consists of contrasting ideas, and contrasting ideas are often presented best with different pacing. A fast pace helps present physical action, conflict, danger, pressure or wit. A slow pace helps present discovery, longing, growth, tension or disappointment. A film that varies its pace will be very dramatic, whereas a film that is biased towards being mainly fast or slow paced will be undramatic because it will not present contrasting ideas effectively. Every generation seems to inevitably grow up to find that films become too fast paced for their tastes. One of the things that has characterised the evolution of cinema is that films have become increasingly fast-paced and frenetic in story, direction, camera work and editing. Every generation seems to inevitably grow up to find that films become too fast paced for their tastes, which formed when they were young. For my parents, it happened at some point in the 1960s, and I don’t think they have truly loved a film since then. For me, I think it might have happened already, somewhere around the turn of the century. With very few exceptions, I find myself emerging from a trip to the cinema wondering why the film I just watched found it necessary to move so fast all of the time. I first noticed the trend towards a faster pace with 2001’s Black Hawk Down. Praised for its intense and unrelenting action, the film is fast paced throughout, with no downtime. One effect was that I was soon burnt out on the action, and I became numb to it. If the film had paused for breath by varying its pace, it could have kept me engaged for longer. Another example is 2013’s Man Of Steel, whose first half was a well balanced mix of fast and slow pacing, but whose second half was a non-stop marathon of people getting punched through skyscrapers. It doesn’t matter how intense the action is and how good the special effects are – there’s only so much of that you can watch before you start to tune out. There’s no drama in it. Ironically, the monotony of such an extended section of fast paced action was to kill the pace of the film stone dead. As I said, I’m a big fan of Star Wars, and my benchmark for well-paced films is the original Star Wars trilogy, including (and especially) A New Hope, which many now think of as “the slow and boring one”. Most of the first half hour of A New Hope features the two droids, C-3PO and R2-D2, wandering around desolate landscapes with little dialogue and no musical score. It’s about an hour before our hero, Luke Skywalker, encounters any physical action. 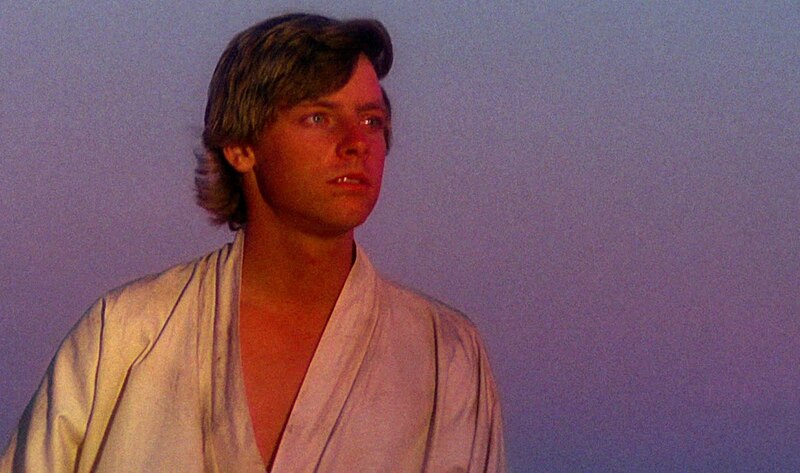 During our time with Luke, he takes a break from his hero’s journey to stare longingly (and silently) into the twin suns of Tatooine while the music swells – for about a minute of screen time; he sits and listens to Obi-Wan Kenobi explain the Force (exposition! ); he trudges dejected from the site of his adoptive parents’ murder; he hunches over with grief at Obi-Wan’s death. All of these slow-paced sections help present the world that our characters inhabit and help present the existence and growth of our characters in that world. Why do this? Because the contrast between the slow paced sections and the fast paced sections makes the action better. When Luke disables his targeting computer, aims at the tiny exhaust port in the Death Star’s trench and pulls the trigger on his proton torpedoes, it carries with it all the significance of Luke’s past, his yearning for importance in the universe, his grief at the death of Obi-Wan, his burgeoning love for the princess, and his relief that Han Solo isn’t all bad. That one fast-paced moment means so much because all of the slow-paced sections up until that point had built Luke’s character and journey into something monumental and iconic. The original Star Wars films do not pull us in multiple different directions without first educating us and investing us in what’s happening. Another way to look at the pacing of the original Star Wars trilogy is at the macro scale of the trilogy as a whole. Each film divides quite neatly into three acts. A New Hope has the escape from Tatooine, the escape from the Death Star, and the assault on the Death Star. The Empire Strikes Back has the escape from Hoth, the trip to the asteroid field / Dagobah, and the ambush at Cloud City. Return Of The Jedi has the escape from Jabba the Hutt, the landing on Endor, and the three-pronged sabotage of the shield generator / assault on the Death Star / confrontation with Darth Vader. Each film moves at a gradual and deliberate pace, with our characters almost always spending a good chunk of time in any one situation. With each film, the complexity increases, from one storyline in A New Hope, to two concurrent storylines in The Empire Strikes Back, and finally to three concurrent storylines in Return Of The Jedi, so that the audience is only served a truly fast-paced act after having spent lots of time getting to know the world and the characters. The films do not pull us in multiple different directions without first educating us and investing us in what’s happening. 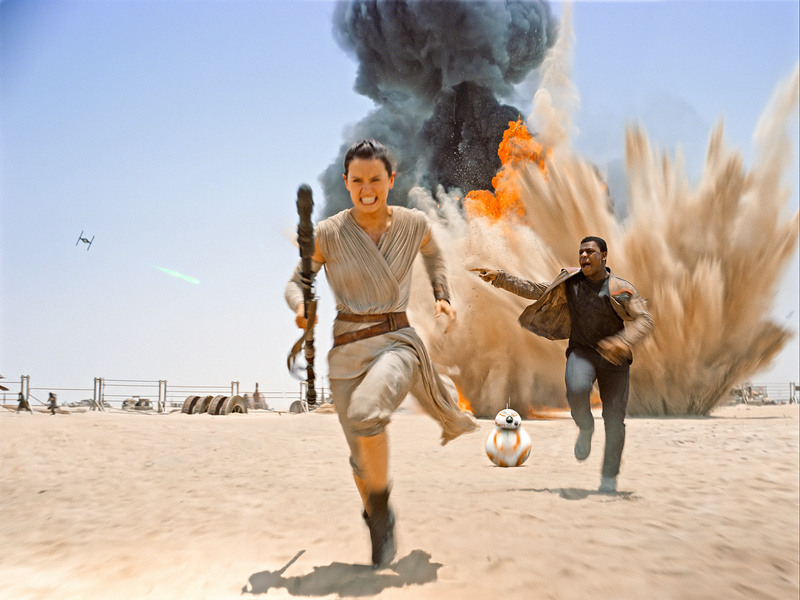 The Force Awakens is paced much faster than the films in the original trilogy. By my tastes, formed by watching the films of the 1990s and earlier, The Force Awakens is too fast paced. This is the first film in a planned new trilogy, meaning it ought to take its time to introduce its new world and new characters. Instead it includes so many locations and concurrent storylines that it’s forced into a fast pace to keep up with it all. There’s no time left in The Force Awakens to simply stop and linger. Where A New Hope had three main locations (Tatooine, the Death Star, and the space around Yavin IV / the Death Star), The Force Awakens has six or seven. And where A New Hope had a single storyline with no tangents, before increasing the complexity in subsequent films, The Force Awakens goes immediately for three concurrent storylines: the search for Luke Skywalker, the mission to destroy a new super weapon, and the mission to, er, sort out some family business (I think I sidestepped a spoiler there). With all of that to get through in two hours, there’s no time left in The Force Awakens to simply stop and linger: to linger on the world, on the mysteries, on the desires and longings of our heroes, on the terrible threat presented by Kylo Ren and The First Order, on the tragedies that our heroes endure. The effect of this is to render the remaining fast paced sections less meaningful than they would otherwise have been. Rey, Finn and Poe Dameron make for engaging new heroes and Kylo Ren is a fascinating upending of the usual villainous stuff we get with Star Wars. It’s a credit to the young actors that I enjoyed watching them far more than I enjoyed the returning cast members from the original trilogy. But unfortunately, all these new characters run a bit thin. I don’t really know what they all want out of life; I don’t know what makes them angry; I don’t know how they grieve; I don’t know what they do for fun. So when these characters are pulled into a great adventure or must do battle with powerful enemies, I don’t know what it means for them to do all of this. Not in the same way that I knew exactly what it meant for Luke to destroy the Death Star. I don’t blame the younger generation for “ruining cinema”. So I think The Force Awakens is too fast paced. But lots of other people seem to love it. And I’m beginning to think that blockbuster cinema has passed me by – that the studios with lots of money on the line simply aren’t making big budget films for people like me anymore. The big money today is in the generation below me, whose tastes were formed in the 2000s, who expect a faster pace from their films, and to whom Hollywood now obviously caters. I don’t begrudge Hollywood for doing this, or blame the younger generation for “ruining cinema” or anything of the sort. After all, I had a heck of a time with the original Star Wars trilogy, and those films aren’t going anywhere. And now it’s the turn of the next generation to have their fun. Meanwhile, for people like me, there are still some wonderful independent films being made like Ex Machina (starring two of The Force Awakens’ young leads) that obviously know the dramatic value of slower pacing. But I can’t help but be a little sad knowing that while I will enjoy the new Star Wars films and find them very entertaining, I will likely never love them. I feel the exact same way about pacing and films being blown through as far as plot and character development. Thanks for writing this. I liked Force Awakens quite a bit, but the pacing and believability are my core issues with the film. Yep, absolutely agree! Thanks for speaking what my fiancee and I immediately agreed upon after leaving the theater. But really, how could the movie have been any worse at all if it took at least a minute here and there to slow things down in significant moments, or for opportunities to develop the characters? It really could only made it better, in my opinion. Here’s hoping there’s more of that in the sequels.